Meet Violet the American kestrel. Many of you might have already met Violet, one of our education ambassador American kestrels. She now has a name! Violet was admitted to The Raptor Center’s clinic in August of her hatch year, 2012. This timing means she was not out of her nest cavity for more than a few weeks. She was unable to fly after a collision with a vehicle. In addition to a fractured right coracoid, she also had trauma to her right elbow and was dehydrated. 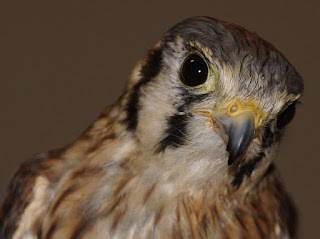 Violet’s name refers to a very unique adaptation that American kestrels might have, as referenced in several professional papers, to assist in finding their prey. Mice and small rodents are a part of a kestrel’s diet. These mammals will often leave a urine trail that could reflect ultraviolet (UV) light. A visual pigment in the cones of kestrels’ retinas absorbs UV light, perhaps allowing them to see this part of the spectrum. You can read about Violet and "meet" our other education ambassadors on our website.